Are you widening the suspension points too? Keep in mind that this will impact roll centers. I'll step aside for those that know more about suspension design. Keeping the suspension the same Bryan, just adding an extra 100mm (4") down the middle, haven't got the expertise to work out if its for the worse or not. Might also extend the engine bay and wheel base slightly as I want to be able to drop the engine and box straight out the bottom of the car with minimal dismantling. At the moment it looks like it'll hit the rear suspension "subframe"
Anyhow back to the welding, a bit more practice tonight, with new spectacles and chamfered edges. If you are widening the distance between the inboard suspension points there will be some changes to the geometry, which may or may not be noticeable. You will also have to widen the Miata rack the same amount, or find a wider rack otherwise you will have bump steer issues. 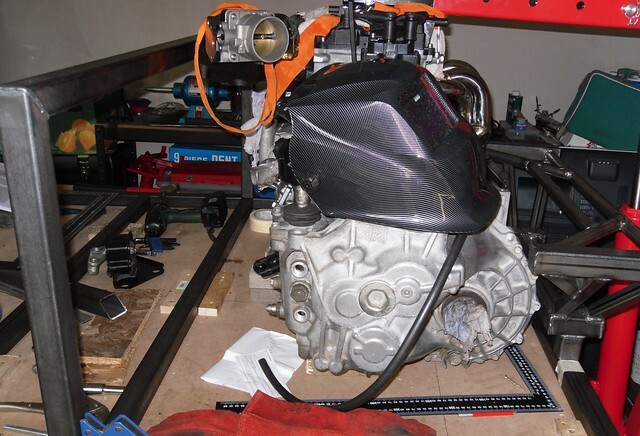 I am able to drop my engine out the bottom, but have to shift if all the way to the front of the engine compartment to get it to clear the subframe. It's tight! Same piece from different angles below. Bryan is correct. If you widen the front of the car, the rack length (or at least its height) will have to change. You can lower the Miata rack, which will minimize, but not eliminate bumpsteer. How much it'll need to be lowered will depend upon how much wider the car is made. Since bumpsteer is a very subjective quantity, while the resulting bumpsteer won't be zero, you "may" decide it's fine as-is. 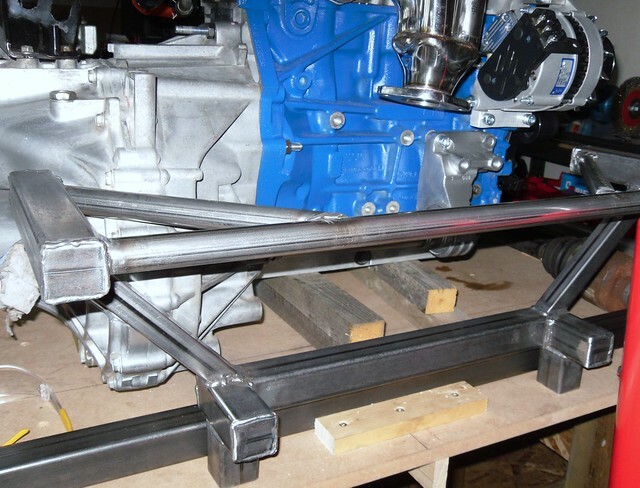 I vote for using the stock Miata rack and seeing how it goes; if the resulting bumpsteer drives you nuts, either get a shorter rack, or shorten the Miata part, which is a straightforward operation, but not trival. Oh, and your welds look good. 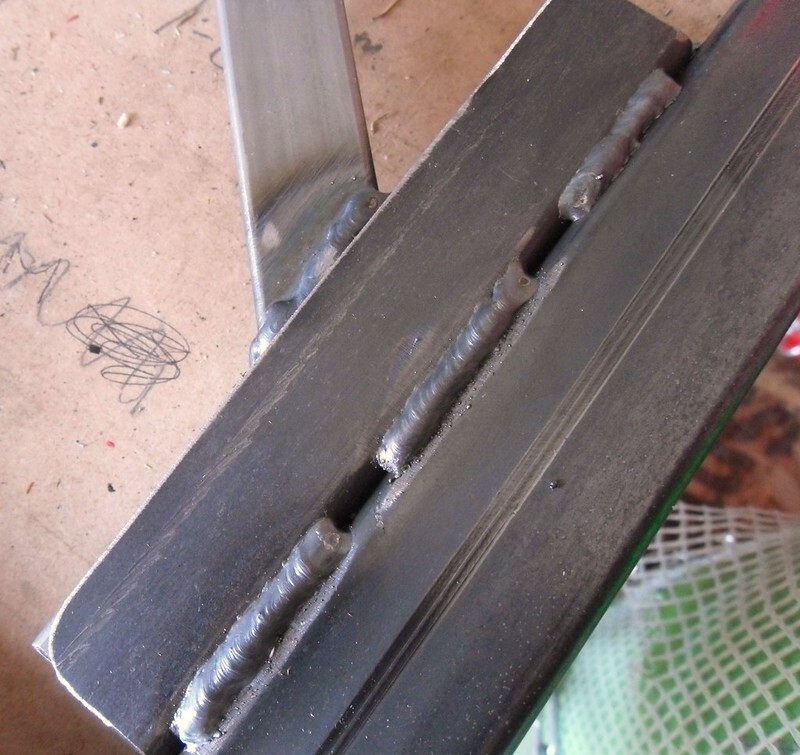 Since they're samples, you should cut a few of them across the welds to make sure there's sufficient penetration. 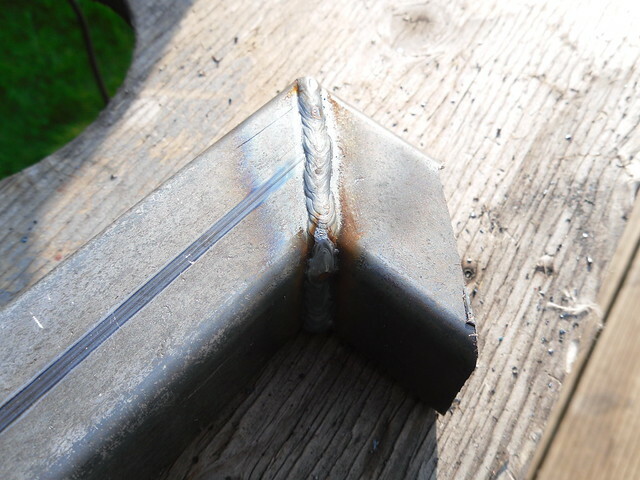 Midlana1 wrote: Oh, and your welds look good. 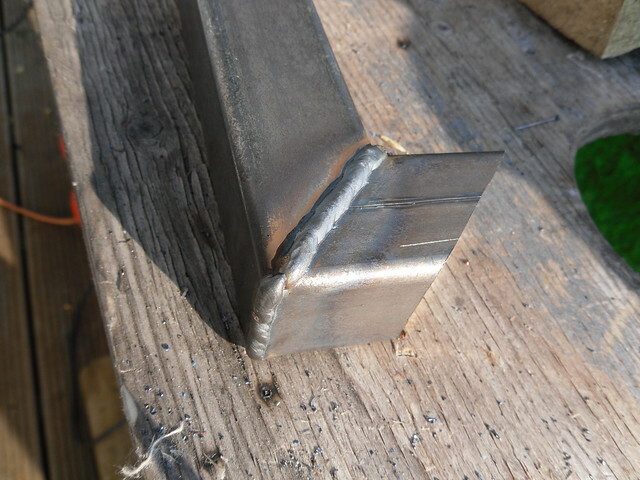 Since they're samples, you should cut a few of them across the welds to make sure there's sufficient penetration. A bit of progress, fabricated the rear suspesion sub assembly so I can check clearances etc, looks like I might need to lenghten the engine bay by 80mm or so, as I want to be able to drop the engine and box through the bottom of the car. Tube is a right PITA to weld a lot harder than box, especially when welding thin tube onto thicker box, new grinder's getting a good workout. Bit more progress, finished the rear suspension subframe,...made up of 23 separate pieces of metal,.. probably not the best place to start for a novice welder, done now so feels like a bit of an achievement. 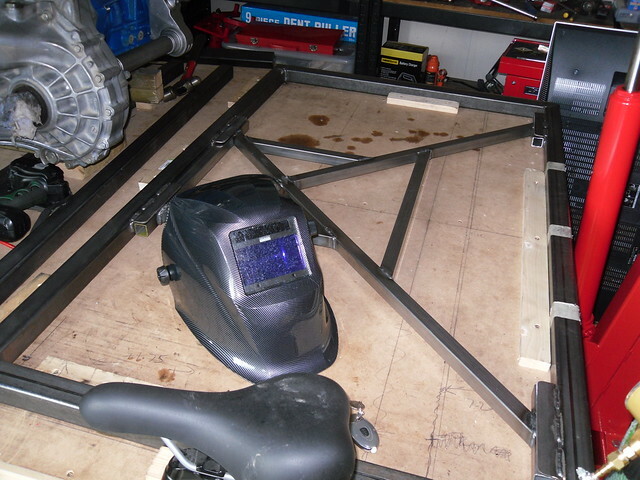 Lenghtened the chassis and also started on the rear bulkhead, so I can check engine bay clearances, which are tight. 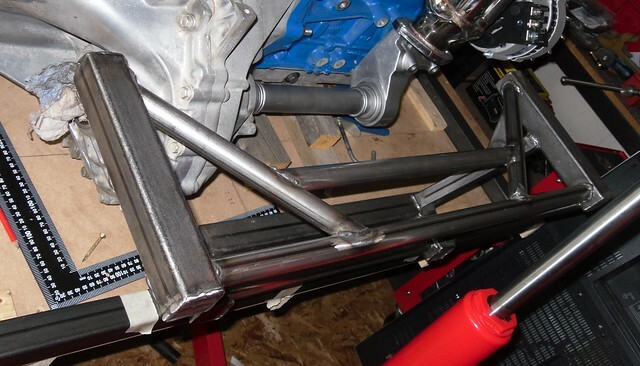 Fabricated a removable subframe and brackets to provide cross bracing underneath the engine/box. Chatting to fellow kit car nuts about the welding this morning,. The welder flatters my ability without a doubt. The machine is an ESAB Caddy, which although costs quite a bit more thatn your average machine its worth every penny in my book. I would struggle with a Clarke or similar welder. With the ESAB you dial in the metal thickness and then do a test run and the machine calibrates itself somehow. You can then fine tune the settings as you go. Working with new metal makes the job so much easier as well. 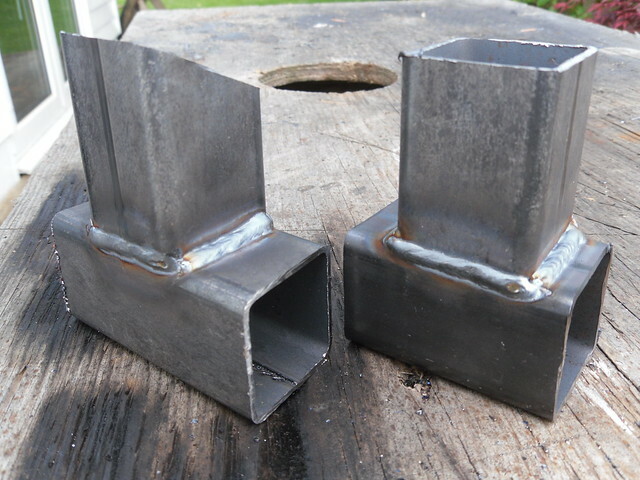 I'm please with how my weldings improved, though still along way to go (welding tubes are a bit tricky) I still grind a few out and redo them now and again if they look a bit crap. An image below of my latest efforts.